Charlie is my 12-week old puppy (shes a girl for those of you who assumed otherwise). As a first-time dog mom, I have taken note of Charlies habits, and in particular, her friendliness and ability to speak with, connect to, and doggie-network with anyone and EVERYONE she crosses paths with. No handshakes just tail-wagging and eye-to-eye connection. When we go on a walk, and Charlie sees someone else on the street, she immediately runs over to them, sits down right in front of them, (wagging her tail excitedly) and looks up to say, hi. After shes made someone feel good, shes ready for them to reward her: Charlie has a belly rub addiction. She lays down with her tummy side up, and most people rub her belly. PERSONAL REALIZATION: After 2.5 years of being in my condo building and seeing these people numerous times, this was my first real conversation that extended beyond hi and have a nice day. I guess I could thank Charlie for being a great ice-breaker, but what stopped me in the first place? Here are some lessons you can learn from Charlie, thatwill have you networking like a dog and earning the rewards you deserve. Connect on an emotional level. Most people who meet Charlie, start off by saying, Awww! She knows how to get to their hearts by giving them puppy kisses and making them feel good. 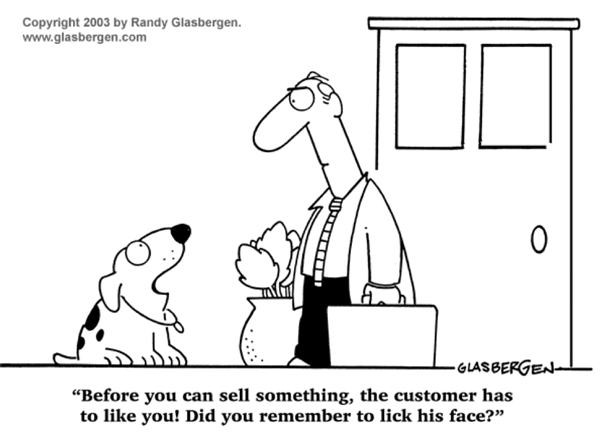 How well do you get to your customers heart? Their emotions? Create emotional dialogue. When people finally look up at me, Charlies owner, they wanna tell me about their dog, or how they want a dog, or about when they had a dog. Make them laugh or at least have prolonged smiles. Charlie makes people smile. The smile leads to relaxed and open conversation. People complete strangers even people in New York City, where no one talks to no one, will talk about dogs and life. Be aware of and adapt to cultural differences. In Charlotte, NC, everyone stops to say hi to Charlie. In New York City, most dont stop, but the ones who do, welcome the opportunity to have a (brief) conversation. Focus on the person in front of you – Could you imagine a dog running up to you to play and then getting on their cell phone? NO! Dogs have no technology and nothing getting in the way of their interaction. Make your customer meetings are the same. Wag your tail and look people in the eye put your phone next to your wallet. Dont care about what you look like, let your personality take over. Look at Charlie! She’s naked. Dont let the weather or outside factors control your attitude. Charlie doesn’t care if it’s raining outside or if it’s 90 degrees and sunny. She is always ready to be happy. How does the weather impact you? What changes could you make so that youre wagging your tail next time it rains? INSTINCTIVE: Without one lesson, Charlie gets it. She is social social in-person and online. Of course she has an Instagram @charliethecav39. And she has lots of followers.